As I’ve mentioned before, I love the Holidays. I love that just like a season of weather, the months from November to January just *feel* different – people are a little nicer, homes are a little warmer, everything is a bit more festive. Now, I may not go all out and string twinkly lights all over our house or set up a host of inflatable characters on our lawn (not just because we rent and don’t have a lawn – ha ha – that all seems like just so much work to me! ), but I love putting all the holiday cards we get on display on the mantle and listening to holiday music (I *really* enjoy Hawaiian Slack Key Christmas tunes – mostly instrumental and such beautiful, warm tones), and I do love decorating the place (this year,I even made a wreath out of saved T.P. rolls – awesome!). And every year, I can’t wait to get our Christmas tree. Well this year, our budget’s a bit tight and though I wanted to start the Holiday atmosphere early (I was thinking of getting our tree before Thanksgiving so we could enjoy it then! ), I knew getting a tree this early would mean they’d be expensive (ha – one year we got our tree SUPER last minute and on *super* sale – Christmas EVE – good times). 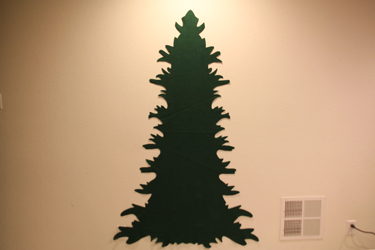 I thought about borrowing Nick’s auntie’s old artificial tree (they just got a new one), but our place isn’t big, and I felt like if we were going to take up space in the living room for a tree, I’d want it to be a fresh one. Then I thought about lugging it up the three flights of stairs like we do every year, getting needles all over the place, and the fact that the kids probably won’t be here for Christmas (it’s just easier to spend more time with them if we go to their house for the celebration). And I realized that maybe I needed to look at alternatives for our Christmas decorations this year. I still wanted a tree, but maybe something smaller that didn’t take up as much space. 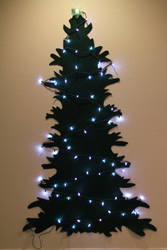 I saw an article on “Small Space Christmas Tree Alternatives” on ApartmentTherapy.com and another one on “Creative Christmas Trees for Small Spaces,” and saw some cute ideas: this IKEA cardboard tree is adorable, but still takes up space – this Backlit LED Tree by Habitat is beautiful, but a bit pricey for me, and this chalkboard tree was really cool looking, but pretty unrealistic – I’m not looking to paint a wall in my house with chalkboard paint. I liked the idea of being able to customize and change the look of the tree, and started thinking about a more “interactive” tree. This sticky note tree was kinda cool – maybe I could have people write notes and add them to the tree when they came over – but that was a lot of sticky notes, and I know they have a tendency to fall off, especially when they’re at the right height for little ones to grab them (and we do have the kids for an overnight this month) … then I saw this “Toddler-Friendly Felt Christmas Tree” idea and the wheels started going. 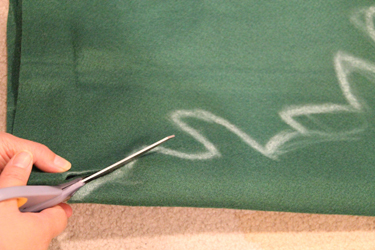 We bought a yard of 72′ width felt from Joann Fabric & Crafts – there was a little extra on the bolt, so the nice lady at the cutting station gave us the rest (about a foot) for free. Score! We also picked up several 9×12 sheets of different colored felt for ornaments. 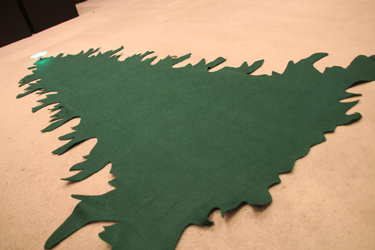 I decided to save myself some creative brain fry and fold the felt in half length-wise, to draw half a tree with the fold line on the inside, and create a symmetrical tree instead of trying to draw out both sides. I used the IKEA design as my inspiration – I liked how the pattern was made to look more irregular and less “bushy” like the LED backlit one was. 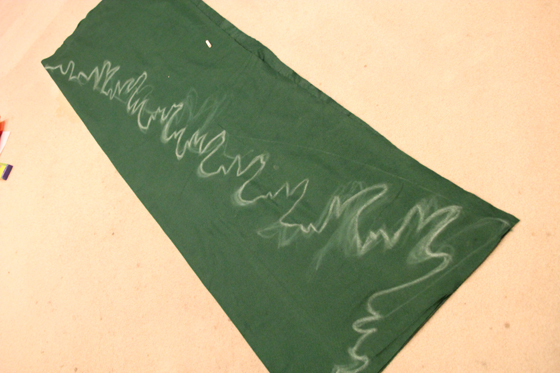 I freehanded my design with chalk – as you can see, that was a good idea – there were plenty of changes as I went along. I also put the “nice” side of the felt on the inside and the chalk side was going to go against the wall, so the line wouldn’t end up showing anyway. I got to work cutting. 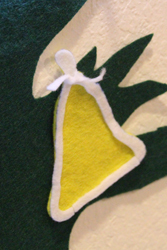 Of course, the basic triangle shape the other felt tree had made for super easy cutting, but this is going to be our home’s Christmas tree this year (and maybe other years in the future! ), so I wanted to make it a bit nicer. 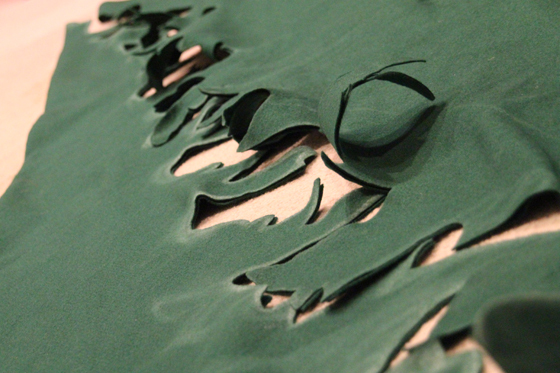 After it was all cut, just the pieces of felt next to each other looked so pretty! 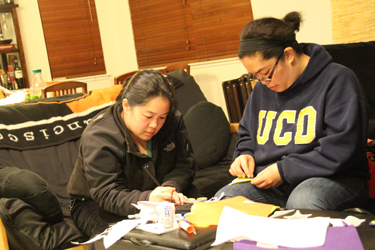 It was coming along! 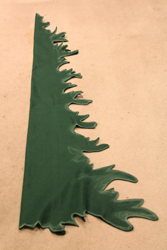 Now I had my Christmas tree shape. I opened it up. Awesome! I even tried on the star Nick picked out. Up it went! But it wasn’t finished of course – had to string the lights! 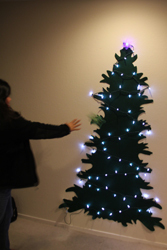 We got some LED lights at Target on sale for $8 (they cost as much as all our felt materials for the tree! 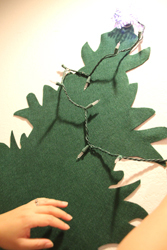 But we wanted to use cooler temp lights since they’d be strung against felt on the wall). Our snowflake “star” was also from Target ($4.50). Holiday sales rock! And tada! We had a lit Christmas tree! But next came really the best part of the this tree – our loved ones! The girls each made their own ornament, adding their own special touches. This tree idea really is cool. Not only can it be produced at a way lower cost than getting either an artificial or cut tree, it’s reusable without having to dedicate a lot of storage space to it, and it also needs way less lights to decorate (this was a 60-light strand – we have several reels of 100-200 light strands for our regular tree decorations). You also don’t have to lug anything around and either spend time setting it in its base or building it, and one of the best features is that you can have visitors make their own ornaments to display on your tree. 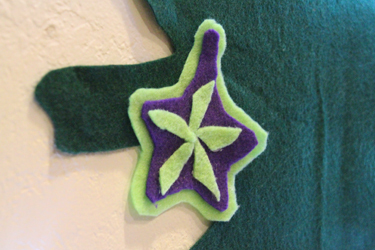 And as JW very correctly pointed out, “felt sticks to felt,” so people can place (and re-place) their ornaments anywhere they’d like with no hassle – no falling pine needles and no lost ornament hooks! 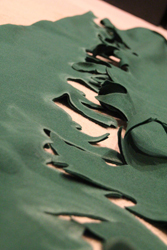 M even tested the boundaries of the stickiness of felt. 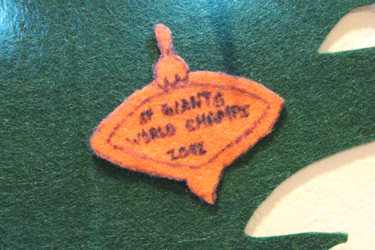 Okay, so it’s not like a magnetic tree, but ha ha ha – the ornaments will stick if you place them on. Look at the beautiful and all uniquely different ornaments our friends made! Love it! This is SOOOOO COOOOOOL!!! Makes a person want to create a unique ornament for the tree. You have outdone yourself this time. Having a flat tree also leaves a lot more room for presents around it! I still think you should sell these.